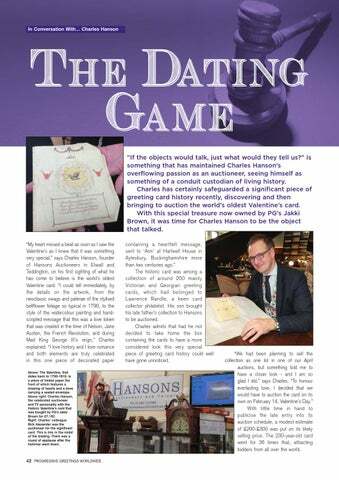 The Dating Game “If the objects would talk, just what would they tell us?” is something that has maintained Charles Hanson’s overflowing passion as an auctioneer, seeing himself as something of a conduit custodian of living history. Charles has certainly safeguarded a significant piece of greeting card history recently, discovering and then bringing to auction the world’s oldest Valentine’s card. With this special treasure now owned by PG’s Jakki Brown, it was time for Charles Hanson to be the object that talked. “My heart missed a beat as soon as I saw the Valentine’s as I knew that it was something very special,” says Charles Hanson, founder of Hansons Auctioneers in Etwall and Teddington, on his first sighting of what he has come to believe is the world’s oldest Valentine card. “I could tell immediately, by the details on the artwork, from the neoclassic swags and paterae of the stylised bellflower foliage so typical in 1790, to the style of the watercolour painting and handscripted message that this was a love token that was created in the time of Nelson, Jane Austen, the French Revolution, and during Mad King George III’s reign,” Charles explained. “I love history and I love romance and both elements are truly celebrated in this one piece of decorated paper Above: The Valentine, that dates back to 1790-1810, is a piece of folded paper the front of which features a drawing of hearts and a dove carrying a sealed envelope. Above right: Charles Hanson, the celebrated auctioneer and TV personality with the historic Valentine’s card that was bought by PG’s Jakki Brown for £7,192. Right: Charles’ colleague Rick Alexander was the auctioneer for the significant card. This is him in the midst of the bidding. There was a round of applause after the hammer went down. containing a heartfelt message, sent to ‘Ann’ at Hartwell House in Aylesbury, Buckinghamshire more than two centuries ago.” The historic card was among a collection of around 200 mainly Victorian and Georgian greeting cards, which had belonged to Lawrence Randle, a keen card collector philatelist. His son brought his late father’s collection to Hansons to be auctioned. Charles admits that had he not decided to take home the box containing the cards to have a more considered look this very special piece of greeting card history could well have gone unnoticed. “We had been planning to sell the collection as one lot in one of our April auctions, but something told me to have a closer look - and I am so glad I did,” says Charles. “To honour everlasting love, I decided that we would have to auction the card on its own on February 14, Valentine’s Day.” With little time in hand to publicise the late entry into its auction schedule, a modest estimate of £200-£300 was put on its likely selling price. The 230-year-old card went for 36 times that, attracting bidders from all over the world.